Caliber: 7.62 mm (.308 caliber). Length: 6.2 inches. Weight: 17.0 ounces. Diameter: 1.5 inches. 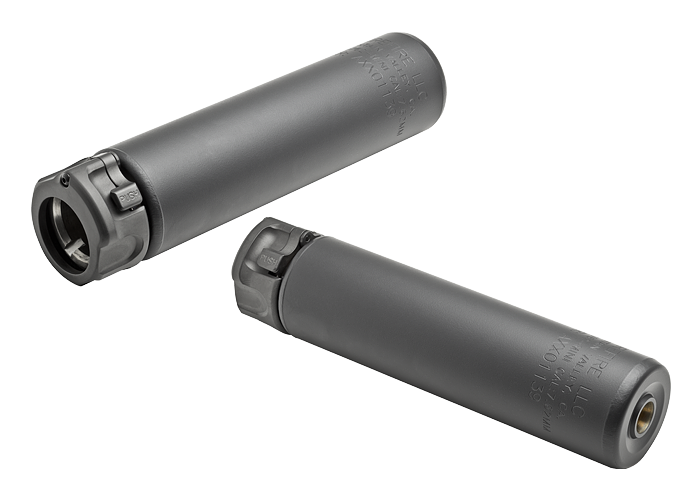 The SureFire SOCOM762-MINI Fast-Attach® suppressor is optimized for use with 7.62x39 and 7.62x35 caliber rifles and will also adequately suppress 7.62x51 NATO caliber rifles with a barrel length of 16 inches or longer. It features the same revolutionary suppressor technology as the SureFire SOCOM762-RC, the most advanced suppressor ever made, which was recently selected by US Special Operations Command as first among all competitors in the most extensive and rigorous suppressor evaluation in history. Just over 6 inches in overall length, the SOCOM762-MINI is 2.2 inches shorter and 2.5 ounces lighter than the SOCOM762-RC. It includes advanced internal venting to reduce back pressure, reducing the suppressed cyclic rate and gas blowback on the operator. The new design also includes an integrated blast shield in the back section that increases durability. The patent-pending front-plate design, along with proprietary improvement in gas-flow dynamics, nearly eliminates first-round flash, a true technological breakthrough in this area. It also attenuates noise and dust signatures to an unprecedented degree. A new indexing system means this suppressor mounts to a SureFire muzzle brake or flash hider even more solidly than our previous models and is easier to remove after extended firing since the index tab is in a low carbon-buildup area. Like all SureFire Fast-Attach models, the SOCOM762-MINI produces minimal, consistent shift in point of impact compared with the unsuppressed weapon regardless of the number of attach-detach cycles. The SOCOM762-MINI is constructed from advanced US mill-certified high-temperature alloys and heat-treated stainless steel, and features a tough, corrosion-resistant Ionbond coating on the Fast-Attach® lock ring and Cerakote™ ceramic finish on the suppressor body, in either Black or Dark Earth color. All SureFire SOCOM Series suppressors require a compatible, latest-model SureFire muzzle brake/adapter or flash hider/adapter for attachment to a firearm. SureFire sound suppressors for rifles and machine guns combine every important suppressor feature: excellent sound, flash, and dust signature reduction—key components of SureFire's Total Signature Reduction™(TSR); minimal and consistent zero shift regardless of attach/detach cycles; rock-solid attachment in seconds; compact size; minimal weight; fail-safe baffles to prevent bullet side-exit; and extreme durability permitting full-time use. In fact, your SureFire suppressor should outlast your firearm barrel, depending on use. All SureFire Fast-Attach® sound suppressors provide crucial tactical benefits—they reduce the weapon’s sound signature, concealing operator's position and protecting both the operator and team members against both permanent and temporary hearing loss, while enhancing situational awareness and communication; reduce or virtually eliminate muzzle flash, concealing operator's position and preserving night vision and unobstructed view; reduce dust signature, concealing operator’s position and maintaining unobstructed view; and reduce recoil, improving bullet impact observation and allowing for faster follow-up shots. Features: Patented Fast-Attach®design provides rock-solid attachment and easy removal in seconds. Optimized for 7.62 x 39 and 7.62 x 35 rifles, will also significantly reduce signature on 7.62x51 NATO rifles with barrel lengths of 16” or longer. Same revolutionary suppressor technology as SureFire’s SOCOM762-RC, winner of US Special Operations Command (USSOCOM) extensive and rigorous suppressor trials. Provides effective attenuation of sound and dust signatures. Minimal, consistent point-of-impact shift compared with unsuppressed weapon regardless of number of attach-detach cycles. Compact and lightweight for minimum overall weapon length and minimum impact on handling characteristics. Advanced core design to reduce back pressure, cyclic rate, and gas blowback. Patent-pending front-plate design and proprietary gas-flow improvements virtually eliminate first-round flash. Integrated blast shield increases durability. Constructed of advanced US mill-certified high-temperature alloys and stainless steel. Redundant-welded subcomponents eliminate parts loosening. Tough, corrosion-resistant Ionbond and Cerakote™ finish in Black or Dark Earth color.